With very fragrant flowers in spring, Rhododendron fragrantissimum is one of the most fragrant of all of the Rhododendrons. This is a hybrid, Rh. edgeworthii x Rh. formosum, and is regarded as one of the best spring flowering fragrant shrubs. A small shrub by Rhododendron standards it flowers in spring. Masses of white flowers cover the plant, a sweet perfume fills the air on a warm spring day. The flowers themselves are single, around 6 cm across and an open trumpet shape. This is an evergreen plant, the foliage is ea deep green with slight ribbing. Excellent in the garden, and equally at home in a container on a part shaded patio or perhaps a in courtyard. Like all Rhododendrons, a slightly acidic soil is best. In containers use a Camellia and Azalea potting mix. Best grown in dappled shade, or at least afternoon shade, once established it is a fairly easy plant to grow. In the garden dig in some well rotted compost, cow manure and blood and bone before planting. Check that the soil pH is on the acidic side. Good moisture is important, as is good drainage. Mulch around the plant to help maintain moisture as well as suppress weeds. Over time Rhododendron fragrantissimum can reach around 2 metres in height, it is easily pruned to around half this if required. It will never be a tidy bushy shrub, however it makes up for its shortcomings with fragrance. 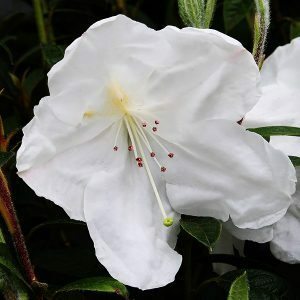 Rhododendron fragrantissimum is available for sale from the following nurseries.